My NativeAdVantage: I am THE Confidence Coach. I share how to build confidence so people can build the life, business or platform they desire. Sheila Kennedy is a lead-by-example coach. As she learns she shares. Sheila struggled with a lack of confidence for years. Recognizing that the skills she taught as a Life skills Instructor for the US Army, a middle school teacher and the owner of a Home Staging and Redesign Business, coupled with courage, would activate the confidence she needed to live the life she desired. In 2013 Sheila wrote the Amazon best-seller, You Had It All Along, as a blue print for women in their quest to build confidence at their core. An entrepreneur since 2008, Sheila is especially enamored with how to practice confidently as a business owner. Recognizing some detrimental patterns that weren’t leading to tremendous success or fulfillment, Sheila set out to build entrepreneurial confidence. 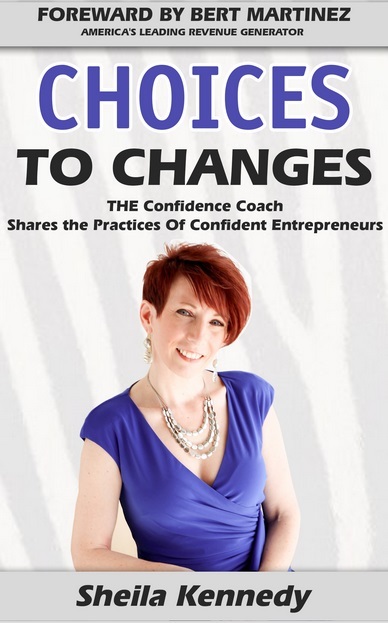 She once again is sharing what she has learned in her new book, Choices to Changes, THE Confidence Coach Shares the Practices of Confident Entrepreneurs to be released in November 2015. The bold truths about confidence along the entrepreneurial journey will surprise, enlighten and inspire the reader to adopt the practices that will lead to their own ultimate definition of success. Provide a safe space for people to explore what areas of their life or business they lack confidence. I am extremely good at observing detrimental patterns that directly and negatively influence confident living and strategize how to change those patterns for positive use. I share how to activate courage, re-frame negative thought patterns and behavior and teach skills to reduce the amount of time paralyzed by fear, doubt or indecision, so both personal and professional growth is achieved. I am the lead-by-example girl. Everything I share is what I have learned through personal experience. I have intimate knowledge of how one’s life can be impacted by diminished or non-existent confidence. I have struggled, survived and have now overcome to experience life with confidence at my core and the benefits that come with it. When someone throws up resistance and thinks I don’t understand what is at stake, they are wrong. I do. I have used all of the excuses why success and growth were fleeting and can strategize through it with laser-like focus so as to not waste anyone’s time, energy or money. I hold out for the potential that someone may not always be able to see in themselves. I will take bigger risks. I will fail. I will succeed. I will grow and I will learn more lessons, skills and strategies. I will build deeper confidence. I will continue to share what impacts people in the most useful ways. Personally, I would love to travel more and enjoy creating experiences with my family and friends. I want to acquire more financial wealth so I can become an extraordinary philanthropist. I hope to build a platform big enough to raise awareness and spotlight issues that are deeply important to me. In business I want to continue writing and coaching. I would like to create opportunities for impact and influence for others. Ultimately I want to open Centers for Entrepreneurial Retreat that provide multi-faceted opportunities for self-care and education to move entrepreneurs forward and grow themselves, their businesses or platforms. The brain and how it works to protect us and keep us safe. If I could go back in time, I would pursue a doctorate in neuroscience and conduct research on how the brain functions during stress and trauma. We do not get to choose ourselves out of every situation, but we do get to choose our reaction. My daughter; Dr. Brene Brown; The Twelve Confident Entrepreneurs I spotlight in my new book, Choices to Changes: THE Confidence Coach Shares the Practices of Confident Entrepreneurs; Hilarie Mae, my energy therapist and Christine Baker Marriage, my massage therapist. The twelve entrepreneurs by name are Jeff Hoffman, Viki Winterton, Bert Martinez, Forbes Riley, Keefe Duterte, Joie Gharrity, Therese Skelly, Karen McMillan, David Dey, Sarah Newton, Cheryl LaTray and Brooks Hoffos. Kauai, St. Bonaventure University, My Office at ROC City Wellness, any natural setting with a pen and paper in hand. My phone, Genbook (my online calendar for connecting with people), legal pads, blank paper, mechanical pencils and art supplies. Writing, creating health and wealth in my life, Social Media Marketing and serving my clients. Leaving my husband and trying to succeed as an entrepreneur who is also a single mom. Leaving the safety of everything I knew and forging ahead into the unknown was such a challenge. I believe I have succeeded because I am still alive and kicking, not only as a mother of a teenager, but as an entrepreneur who owns a coaching practice that has clients and published books and a platform that is growing. There has been a huge learning curve over the last five years and I felt like I was way behind for a long time. I kept plugging away and learned what I needed to know and found people to mentor me so I could succeed. Today, I allow my strength, resilience and determination to shine through as I continue to build my business. Although it will always be a work in progress, it is getting easier the longer I do it. I succeed every time someone shares with me that they did something that was really hard and overcame just like I did. There isn't much better in life than knowing that you have had a positive impact on someone. Biggest disappointment - how did you/will you overcome it? Oh I try pretty hard not to be disappointed in anything. Everything happens for a reason. Sure, would I have liked to pursue advanced education so I could conduct research? Yes, but my High School guidance counselor thought I wouldn't like to be in a lab, especially if I was ever going to be a mother. As sexist as it sounds, he was right. I wouldn't have liked not being around people and I enjoyed being a stay at home mom for a long time. The truth is that if I had become a research scientist, then I would have missed out on all of the amazing adventures I have been a part of like living in Hawaii and become an author. I also wouldn't have had any impetus to do the kind of research that I would like to do today. Back then it would have been AIDS or cancer research. Today I am fascinated by how people react to trauma and how it shapes the way they think and behave. I wouldn't have cared about that when I was younger before I experienced my own trauma. Plus, I get to conduct my own research every day in my coaching practice. That is a true gift I would have missed if I had become a research scientist twenty five years ago. I am pretty grateful that even the things that I may have wanted have turned out like they have. 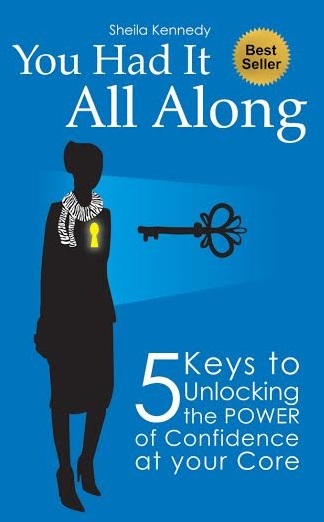 I have been so blessed along the way even when things didn't exactly turn out as I had planned..
Aside from being a parent, I would say that writing, You Had It All Along, 5 Keys to Unlocking the POWER of Confidence at Your Core, would be what I am most proud of. Not necessarily because I am a published author, but really because of all of the confidence building that went in to it before I wrote it. It is a true testimony to all of the hard and long work I did to get to a place where I could recognize that I had something valuable to offer and then articulate and share it.